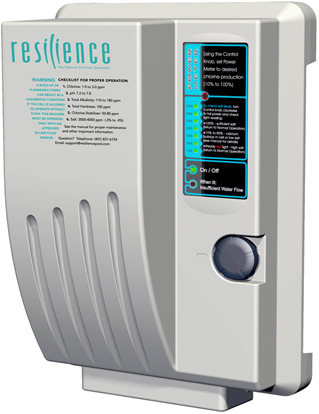 When considering a salt water systems, none can match the quality and efficiency of the Resilience salt water systems. Below is all the information you need about Resilience and Salt water systems. Call or email us today to talk about a salt water system for your pool. With the Natural Chlorine Generator, buying, hauling, and handling chlorine is a thing of the past. Your pool will have fewer chemicals which is healthier for you! To achieve all of you pool’s purification needs, the natural chlorine generator system uses a very low concentration of ordinary table salt, less than the concentration found in the human tear. Normally chlorine comes in a concentrated form to enable its transport and use. This concentrated form of chlorine is caustic and harmful to humans and the environment alike. The Natural Chlorine Generator uses natural salt minerals to produce a “free” form of chlorine in small amounts that is immediately and directly infused into the pool water for sanitation. When the free chlorine finishes cleaning and disinfecting the water, it naturally converts right back into salt, which is reused to make free chlorine again (a perfect cycle). Since the free chlorine is made and used within the pool water, this method eliminates the risk of chlorine spills and the use of concentrated forms of chlorine. Is having a salt water system like swimming in the ocean? has only about 3000 parts per million salt. At 3000 ppm, you generally cannot even taste the salt. system gives your pool the best water quality you have ever seen. Does having a salt water system soften the pool water? pool, but read your directions carefully. The salt quickly dissolves in the pool water.